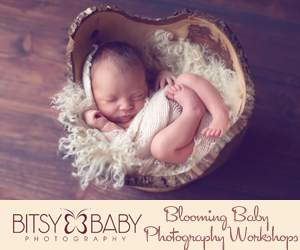 Announcing our Baby Photography Workshop Giveaway! It is just too easy to enter! Head over to our Facebook page HERE for the details. On March 29th a winner will be announced! I have been asked numerous times why take time out of a successful portrait business to teach other photographers...well I was a self taught photographer for most of my career and it took years of trial and error and practice to improve and learn. I offered to intern for established photographers when I didn't have the finances yet for workshops but nobody wanted to hire me--they told me the market was saturated, there wasnt room for more photographers, that it was a hard business to be successful so find something else--yes the professional industry told me these things. Talk about discouraging, well with the support and encouragement of my husband, family, & friends to push through and learn. Through the years I have improved and built a successful profitable portrait business and wish to help in the success of those seeking to fulfill their dreams in this business. I have mentored photographers over the past year one-on-one and have found great satisfaction in giving back and helping those starting out where I did myself years ago. But with a new baby and my portrait business being very busy I have less time on my hands. So this year I have decided to offer small group workshops, adding more to the curriculum and allowing aspiring photographers to walk away with what they need to start on the right foot in a baby photography business. I still have limited one-on-one openings if you do prefer that type of learning environment. This workshop is ideal for photographers wishing to learn more about photographing babies, start a baby photography business, improve your business, or add babies to your already established portrait business. Please visit our website for a portfolio of images and more information on the studio and my work. **all posing guides are scheduled to be released by May 20, 2012. *edited to update giveaway announcement date.